Getty, Ian A.l.. "John Snow". The Canadian Encyclopedia, 10 March 2017, Historica Canada. https://www.thecanadianencyclopedia.ca/en/article/john-snow. Accessed 21 April 2019. John Snow, or Intebeja Mani, meaning “Walking Seal,” Indigenous spokesman, philosopher, statesman, spiritual leader (born 31 January 1933 at Morley, AB; died 15 June 2006). Snow was the first Stoney-Nakoda ordained in the United Church of Canada (1963). John Snow was born to Cora Bigstoney and Tom Snow on 31 January 1933 at the Stoney-Nakoda reserve in Morley, Alberta. His great-grandfather, chief Jonas Goodstoney, gave Snow his Indigenous name, Intebeja Mani, meaning “Walking Seal.” He was known by this name until the age of eight, when he was sent to a residential school run by the United Church of Canada in Morley. He was subsequently referred to as John Snow, named after his uncle who died in a car accident in 1929. Snow finished school at the age of 16, at which point he returned home to his reserve, where he learned to hunt and trap. From 1958 to 1962, Snow attended and graduated from the Cook Christian Training School in Phoenix, Arizona. He was the first person of his band to earn a post-secondary diploma. Upon his return to Alberta, Snow enrolled at St. Stephen’s College in Edmonton. He was ordained as a United Church minister in the spring of 1963. Snow was the first Stoney-Nakoda ordained in the United Church of Canada. In 1960, Snow married fellow student, Alva Townsend, a Quechan from Arizona. Together, they had seven children: John Jr., Rachel, Terry, Tony, Gloria, Billy and Teresa. 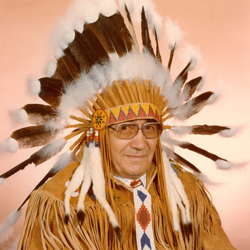 In 1966, Snow served as a minister to two Cree First Nations in eastern Alberta: Whitefish Lake and Saddle Lake. He also ministered to Carry the Kettle First Nation in Saskatchewan and the Apache and Pima communities in Fort McDowell, northeast of Phoenix. In 1968, he became minister of his reserve in Morley. Snow was a dedicated Christian Stoney-Nakoda throughout his life, and believed that Christianity and Indigenous spirituality could exist in harmony. Snow was involved in organizations and events that brought the two religious views together, including the All Tribes Presbytery of the United Church and the Indian Ecumenical Conference, which was a continent-wide gathering of Indigenous elders, youth and church leaders concerned about their spiritual heritage. On his return home in 1968, Snow found a community struggling with unemployment, the difficulties of self-government and socio-economic issues, such as inadequate housing, education and medical services (see: Indigenous People: Economic Conditions; Indigenous People: Social Conditions; Indigenous Women’s Issues). He made efforts to bring these problems to the attention of government officials, but was met with little success because he was not an elected representative of the community. Many members of his band and community elders encouraged him to run for chief of the Wesley Band — a position that might give him more leverage with the federal government. Although he initially refused, Snow decided that this might be the only way he could bring government attention to his community. Snow was elected chief of the Wesley Band in 1968 and took office in January 1969, and served in this position for the next 24 years. He was re-elected as chief from 1996 until 2000, when he retired from politics. During his tenure, Snow fought for Indigenous rights and helped to establish a number of new public facilities in his home community. A strong supporter of education, Snow also helped to establish community-controlled schooling in Morley and to bring the World Indigenous Peoples Conference on Education to his home community in 2002. When the Trudeau government proposed the controversial 1969 White Paper, Snow and other Alberta chiefs presented their response to the House of Commons in 1970, Citizens Plus (also known as the Red Paper). This report asserted Indigenous and treaty rights in Canada (see Indigenous People: Government Policy). Active in his support for Indigenous rights, Snow became director of the Indian Association of Alberta’s Treaty and Aboriginal Rights Research program in 1971. In this position, he learned about and researched land claims and treaty rights. In 1990, and again in 1999, Snow used this knowledge to successfully negotiate two land claims for his people, the Stoney First Nation. In 1976, Snow lobbied for and received an audience with Queen Elizabeth II. The following year, he presented Prince Charles with a book that he wrote about the history of his people, entitled These Mountains are Our Sacred Places (1977). Snow earned many awards and honours during his lifetime. Some of the most prestigious included an honorary doctorate of laws degree from the University of Calgary in 1981 and an honorary doctorate degree in divinity from Cook College and Theological School in Arizona in 1986. Perhaps his greatest honour is that he is remembered as a humble and intelligent leader who helped protect the rights of Indigenous peoples and brought attention to Indigenous issues. John Snow, These Mountains are Our Sacred Places (1977). James Treat, Around the Sacred Fire: Native Religious Activism in the Red Power Era (2007).